On the 5th of November Darboven Idee Prize – the most prestigious award for women with promising business concepts and pioneering business ideas – awarded the prize for the most talented female founders of 2015. Darboven Idee Prize let young creative women describe their startup idea, become recognised and challenge themselves. “I am convinced that we need courageous women who dare to step into self-employment and who are willing to take an entrepreneurial risk,” said Albert Darboven, owner and managing director of the Hamburg-based company JJ Darboven. “We need more female role models, we need more mixed teams and more women in positions of responsibility”, he added in his speech during the ceremony. After reviewing 215 applications, the jury invited five finalists to Hamburg to present their innovative ideas. 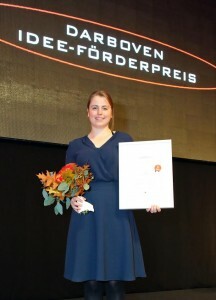 Based on the degree of novelty, already achieved or expected commercial success, personal commitment of the founder and already created or potential jobs, the jury, chaired by Dr. Henning Voscherau, a former Mayor of the City of Hamburg, selected three award winners – Membrasenz, Coolar and HygieneApp. Coolar has an innovative solution for a common household appliance – the refrigerator. It involves green pioneer technology and faces the world-wide need to cool medicine and other products in regions where electricity access is still an issue. “Because of our mission to bring this appliance to regions where cooling is a real problem, we are not only a hardware start-up, but also a social business,” says Julia Römer. Looking forward to starting the first pioneer projects in developing countries already in 2016, Coolar does not only change the way refrigerators work – it fights to make a real impact on people’s lives while preserving vaccines in countries where access to electrical energy is a challenge.